Hello readers, and everyone else. How are you?? I know, I know it has been a while. It is crazy how time passes and how I find it difficult to write my recipes and share them with you. Contrary to my lack of posts, I have been cooking. But my family and I have had so much family visiting recently that it is difficult to find time to allocate to my blog. Any way here I am. Before you will have no more tomatoes in your backyard, I wanted to share this yummy and very very easy recipe of Tomates Provencales. There are a million recipes out there, but really the best part of this recipe, is that you can pretty much use all that you have in your cabinets to flavor those tomatoes. Indeed, the recipe calls for Bread crumbs, but you can substitute it with crackers, or bagel chips that you would have crushed. One day, I even used some white cheddar cheez-it because I did not have any more bread crumbs. 1 tbsp of garlic salt. Place all the dry ingredients into a small bowl and mix well. Cut the roma tomatoes in half. Place them into a flexipan or a large round. Sprinkle the bread mixture over the top of the tomatoes. Bake the tomatoes for 15-20 minutes. Last time I went there, a couple of days ago, I bought a few peaches, a cantaloupe, a few red tomatoes and a gallon of strawberries. Yes, a gallon… That is a lot I know, but I intended to use them in my morning shakes, eat them for a snack during the day, and give some away. I wanted to give some away to my mother-in-law, but when I went to here house, I saw that she, too, had purchased a gallon of strawberries … so I had to take mine back home and figure out what to do with them before they got spoiled. Really, what can you do with strawberries?? especially a gallon of strawberries??? Of course you can make fruit salads, jams, tarts, cream, ice-creams and many, many more desserts! 1 tbsp of basil olive oil, I used the Demarle Basil olive oil. 1 tbsp of fresh basil chopped. Slice the baguette thinly, and place it on top of the silpain atop a medium perforated sheet. If you do not have either, place the bread onto a cookie sheet. Cook the slices for 5-7 minutes or until they are crisp on both sides. Meanwhile, prepare the strawberry topping. Chop the strawberries and place them into a medium-sized bowl. Add 1 tbsp of olive oil, and balsamic vinegar, a dash of salt and of pepper, the chopped basil and mix well. When the sliced baguette are crispy, remove them from the oven and let them cool down. Spread the cheese over the baguette. And spoon a bit of the strawberry mixture atop the cheese. Eat right away;-))) Miam. 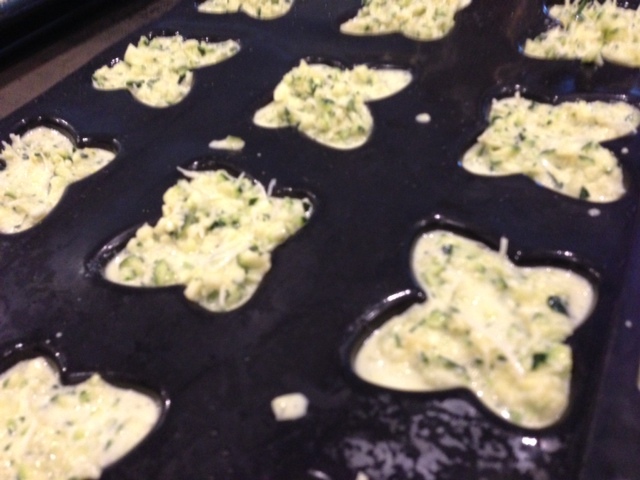 1 tbsp of basil love oil, I used the Demarle Basil olive oil. Cook the slices for 5-7 minutes, or until they are crisp on both sides. And spoon a bit of the strawberry mixture atop the cheese. Meyer lemon is my top favorite fruit. It is hard to explain what a Meyer lemon is, other that it has an exceptional taste. If I can describe it, it smells and tastes a bit like a mix of lemon and mandarin: tangy, subtle …yummy!!! I am not fan of lemon, but love, love, love Meyer lemon. The problem is that they are very very seasonal and it can be difficult to find them. In fact, in our little town, only one grocery store carry them. So no need to say that when they arrive on the stand, I purchase them … sometimes not even knowing what I am going to do with them. Well, this time around I bought a few dozens and decided to make a lemon granita. I could have made sorbets but was too lazy to take out my ice cream machine. For some of you who do no know what is the difference between a sorbet and a granita. A granita is a semi-frozen dessert made from sugar, water and various flavorings – no dairy is involved. Basic granita begins with a boiled sugar syrup which is added into a fruit juice. The granita is then placed in the freezer in a shallow pan and scraped occasionally with a fork which produces a course texture. A sorbet, on the other hand, is a frozen dessert made from sugar, water and fruit juice or fruit puree, sometimes chocolate, and sometimes wine, and/or liqueur. * Sorbet also has no dairy ingredients, but is frozen in an ice cream freezer for a smoother texture . So depending which freezing process you will be using,, you will end up with a granita or a sorbet. Whichever, it is delicious. Ingredients for 4 cups of Meyer Lemon Sorbet or Granita. In a small saucepan, cook the water and the sugar to make a syrup. Meanwhile zest about 2 lemons to get the zest that you need. Set aside. Also juice all the lemons so that you will have about 2 cups of fresh juice. Add the lemon juice and the zest to the syrup and mix well. Either use an ice-cream maker to make the sorbet according to the machine , or fill a container with the mixture and place the container into the freezer so that it will freeze. If you are making a granita, place the container in the freezer for several hours ( 5 hours at least). With the spoon, scrape the frozen mixture. You will be making the granita. Serve as a dessert, or in between meals to help with cleansing, and digestion. Ingredients for 4 cups of Meyer Lemon Granita. Serve as a dessert, or in between meals to help with cleansing, and digestion. Eh voila, Easy, Yummy and delicious!!! Espuma is a a foamy dessert, a whipped concoction made of fruit. Unlike many other mousse, in the Espuma, air or gas is added to a juice or a broth to make a lighter texture. An espuma or thermo whip is commonly used to make these foams through the making of a stock, creating a gel and extruding through the N2O canister. I wanted to present you the Peach Espuma because I like to serve it along a peach tart. Fill a medium saucepan with water, and bring to boil. When the water is boiling, drop all 2 peaches in the saucepan at the same time, and keep turning them around for a minute or so, so that they will cook evenly, and will be easy to peel. Peel the skin of the peaches. In another saucepan, fill 1 cup of water. Add the peaches that you would have quartered, 1/8 cup of sugar, 1 tbsp of green tea leaves, and bring to boil. Let it simmer for 5 minutes. Remove the peaches from the water, and puree the peaches with a hand mixer. Sieve this puree. Set aside. In a small bowl mix 1/2 pack of gelatin with 1 tbsp of water and let it expand. Place the puree back in a small saucepan, add 2 tbsp of sugar, and bring to boil. Add the gelatin, and stir. Remove the pan from the stove and let the puree cool completely. When the puree is cool, pour it into a whipping container such as ISO. Follow the instructions to make the espuma. Fill small glasses with the espuma for each guest. To serve your dessert, place the tart, the glass of Espuma, and a scoop of ice-cream on a plate. 3. i like to hang outside when the sun goes down. For those same reasons, we grill last night. I had salmon and asparagus while the rest of the gang enjoyed some sausages and roasted potatoes. Because I always fix too much vegetables ( or I fix just enough but no-one else is eating them), I was left with quite a few extra asparagus today. What to do? 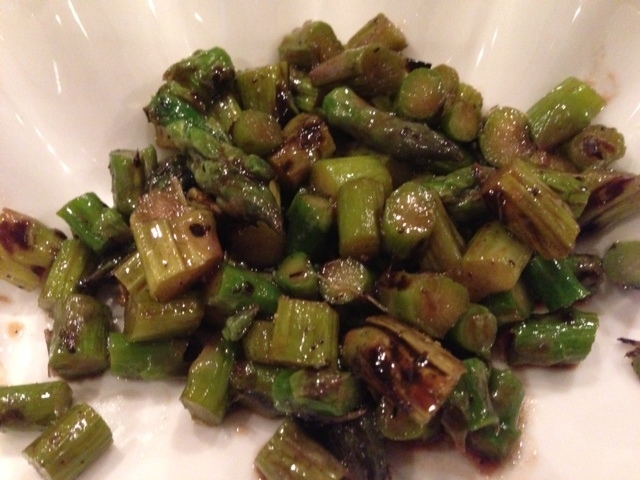 Personally I do not like to rewarm asparagus the next day because they don’t taste wonderful therefore I thought of making a salad with that this evening , and I was quite happy with their flavor. If you have some left-over grilled asparagus, skip step 1-4. Rinse the asparagus under running water and trim the ends. Place the asparagus in a bowl, drizzle some olive oil over them, and with your fingers toss the asparagus so that they will be well-coated with olive oil. Turn the grill to medium and grill the asparagus for 2 minutes on each side. Meanwhile, in a bowl mix the olive oil, balsamic vinegar, salt and pepper. 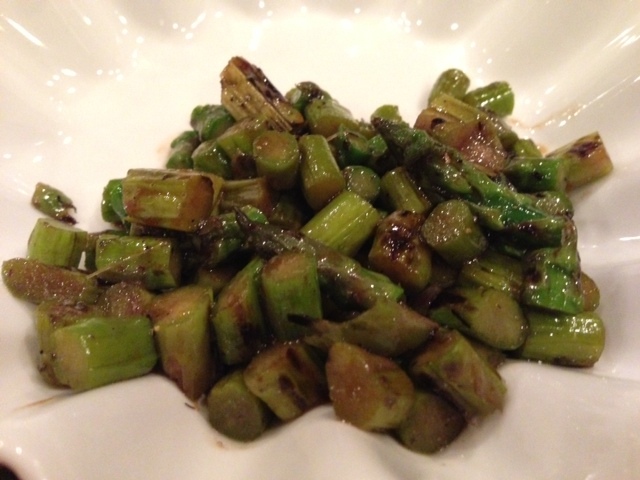 Place the asparagus on a cutting board, and with a sharp knife cut them in small segments of about 1/2 inch. 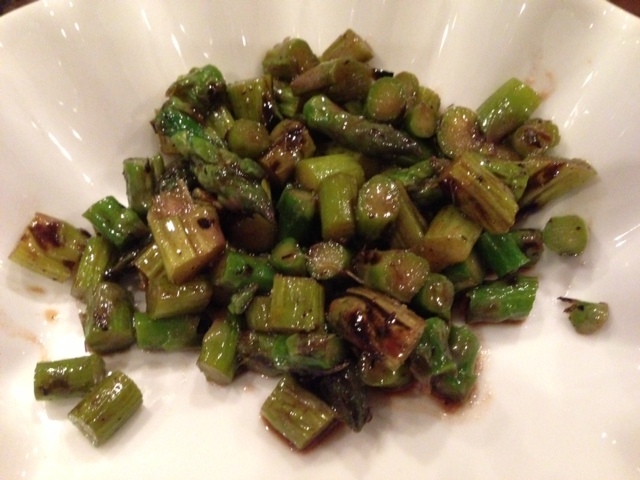 Toss the cut-up asparagus in the vinaigrette, stir and enjoy. Fridges are fun to look into. By looking at someone’s fridge you can tell if that person cooks, loves to cook or just dine out. Generally a person who cooks will have an array of things to use at all times. Things like cheeses, pie crust, and raw ingredients. I like to keep things like pie crust, puff pastry, phillo dough, wonton wraps because they are medium that can help you get dinner on the table quite fast. I love to use wontons to make fun appetizers. The pie crust of course can help you make tartlets, quiches and pies. This past Friday, some friends of ours decided to come by unexpectedly to pick up some things at the house, and since it was close to diner time, I quickly ran to the store to get some meats to grill. We made a salad, some vegetable flan a tart for dessert. Not too bad for an unexpected dinner;-) Of course it is easy if you already have everything on hand. 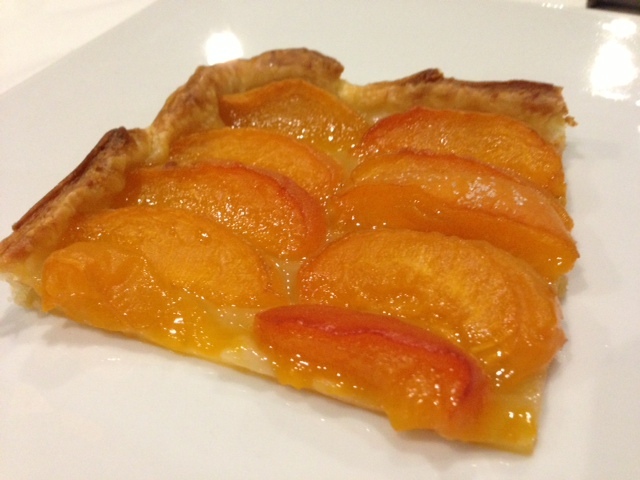 For dessert, I made an Apricot tart because it is easy to do and I had no other fruits than apricots on hand. Of course, you can do this recipe with pear, apple, plum and strawberry. 1 puff pastry dough thawed at room temperature for 15 mns. Turn the oven to 450. 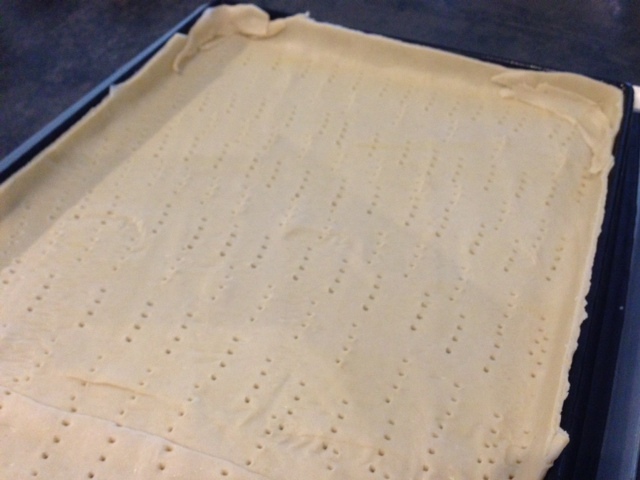 Place the puff pastry dough onto the roulpat and with the rolling pin, roll the dough so that it will fit the flexipat ( 12 x 15in”). With a fork, perforate the bottom of the pie. 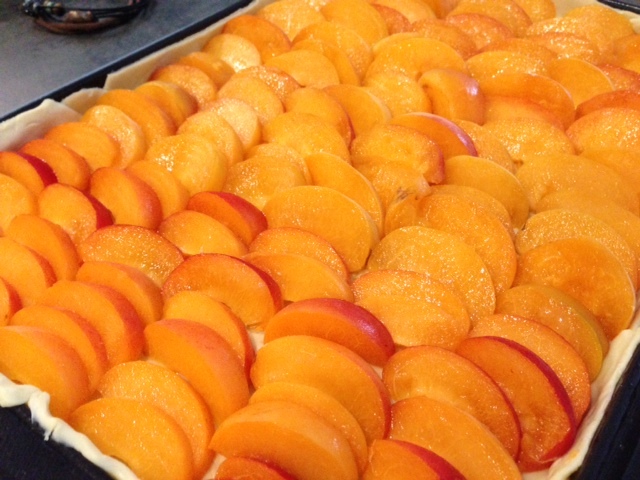 Cut each apricots in 8 quarters and lay them out onto the phyllo dough. Sprinkle some granulated sugar and cook the pie for 20-25 minutes. 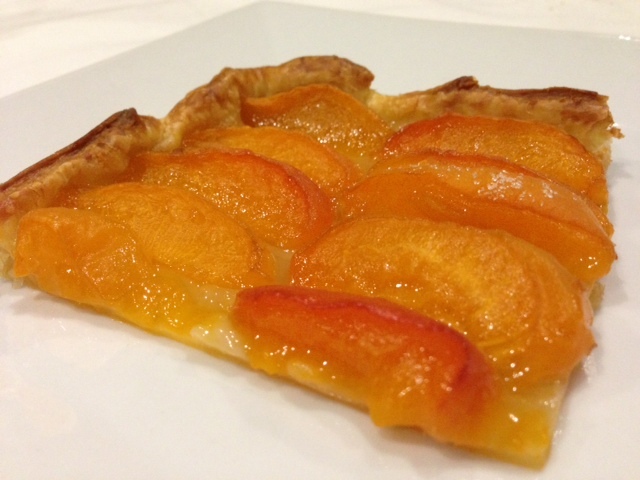 Sprinkle more sugar so that it will caramelized the apricots a bit and cook for another 5 minutes. 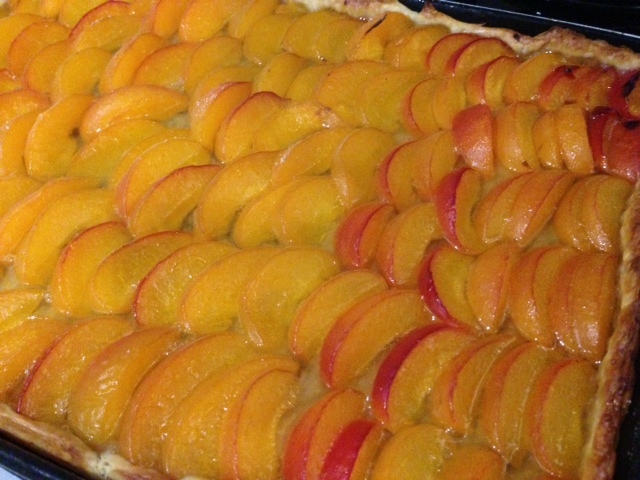 Remove the tart from the oven and let it cool a bit before serving. Serve cold, or warm with or without ice-cream. Et voila! But what to do with them. Even me who eats lots of vegetables get tired of eating the same vegetable over and over again. Zucchini is a prime example. How else can you eat it besides grilled, steamed and again grilled??? 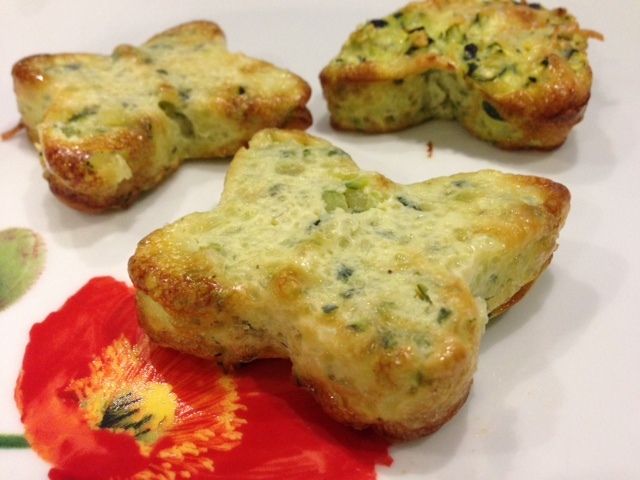 My sister-in-law makes zucchini muffins. 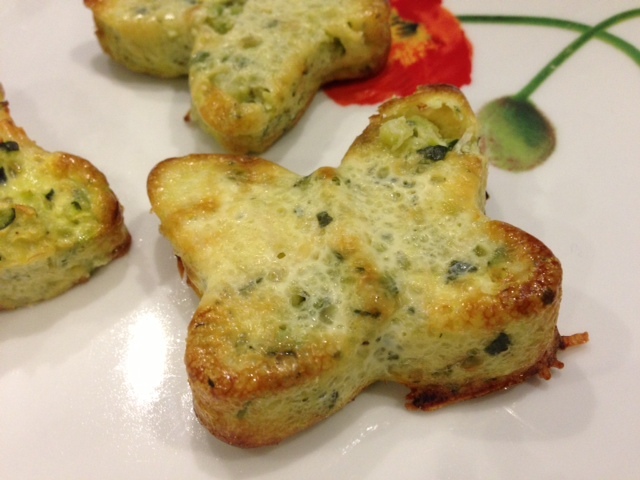 They taste pretty good, but it is not something I want to fix with zucchini. My sister shared this yummy recipe that make for great sides to any dish. Today I am using fresh zucchini, but you can certainly substitute zucchini with any other vegetables. Ingredients for 8, which makes 2 trays of 12 butterfly. Turn the oven to 350. 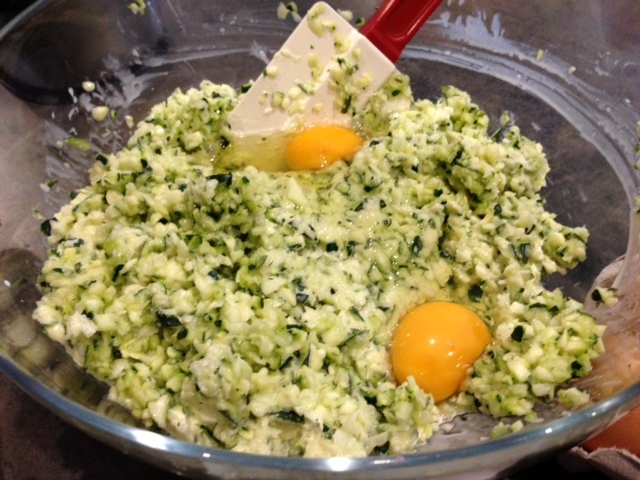 Using a mandoline, or a hand grater, grate the zucchini and fill a bowl with them. Add to it, 4 eggs, 1 tbsp of corn flour, 1 tsp of salt, 1/2 tsp of thyme, and mix well. Scoop this content in the mold or container of your choice. Today i used the butterfly mold (on special this month), but your could use a big muffin tray or even bake the whole thing in one big mold such as the sunflower mold. Cook for 30 minutes in small container, and 60 minutes in a large one. Serve those yummy butterflies with a dinner of your choice. Et voila!! !